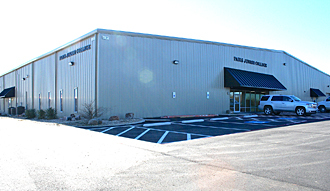 The PJC - Sulphur Springs Center is located at 1137 Loop 301 East in Sulphur Springs, Texas. The PJC — Sulphur Springs Center is located at 1137 Loop 301 East in Sulphur Springs. A wide variety of technical, workforce and academic courses are offered, both days and evenings, at this center that prepare students for the workforce and lead to an associate's degree. Courses in computer information systems, welding, office technology and drafting and 3D printing are available, plus all the supporting learning skills and academic classes. Students can complete all the requirements for associate degrees and certificates at the Sulphur Springs Center. Financial aid and academic advising are available to aid students in making their educational decisions. Continuing education programs in health, business occupations and other topics are available to residents of the community. The Sulphur Springs Center also offers free GED preparation courses.